Zwift Run is not simply an app to help you in your training, it’s a community of like-minded people. Just like outdoors we make friends, share experiences and run together. Hooking up with others makes running more fun. It helps to motivate us and often pushes us out of our comfort zone which is how we make gains in fitness and performance. 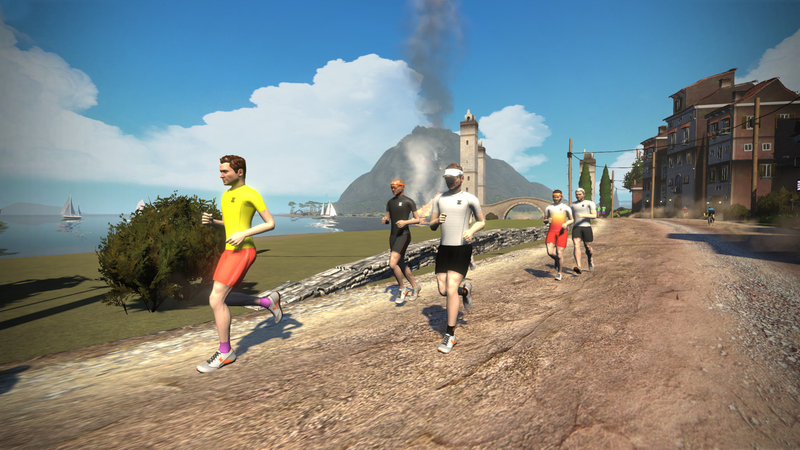 The Meetup feature is a great way to harness that community spirit in Zwift, providing an effective way to organize a run with friends or others of a similar ability. 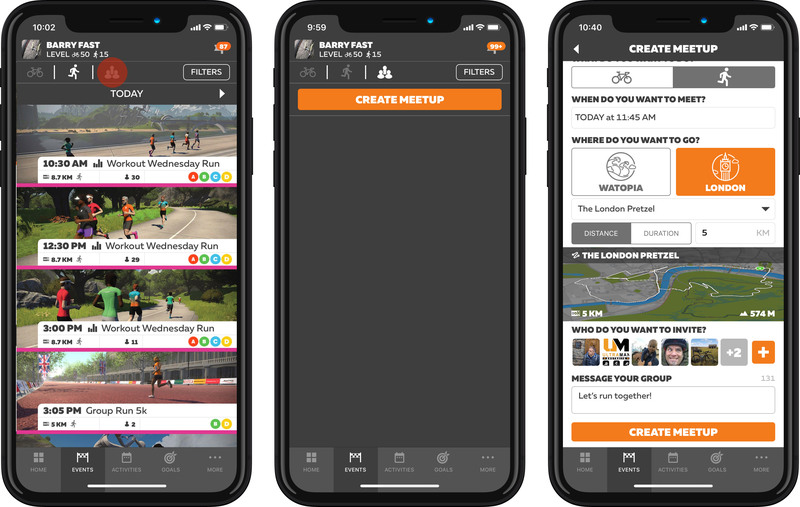 To create a Meetup you’ll need the Zwift Companion App. Click on the Events tab and you’ll see filters for cycling and running events but also a third option. This is the option to create a Meetup. You’ll need to confirm that you want to create a Run as opposed to a Ride. Then you decide when and where the run will take place and either a duration or a distance. You can now choose who you would like to invite. The Meetup Feature allows you to invite any Zwifter who follows you. If you have a friend on Zwift whom you would like to invite, simply press the plus button and type their name into the search box. You can invite a maximum of 50 followers to join you. There is an option to include a short message with your invitation before you click Create Meetup. Any runners you have invited need to confirm that they will be attending, but then you’re good to go! Anyone attending the Meetup should plan to be in game before the event begins. 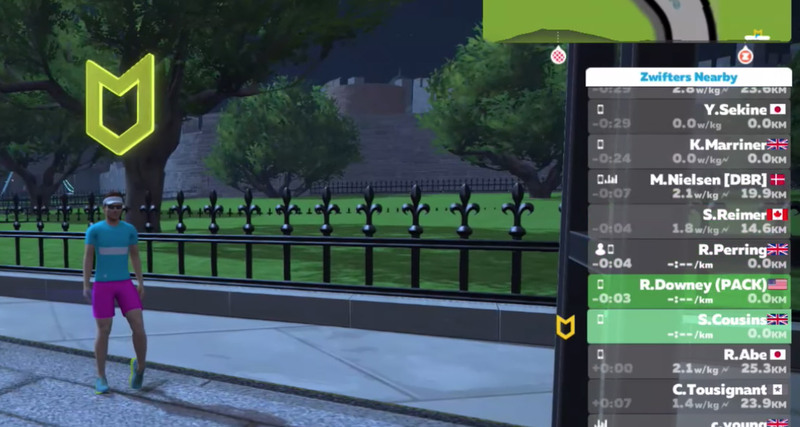 An on-screen prompt will guide you to join the Meetup a few minutes before the event starts. The organizer of the Meetup becomes the run leader, indicated by a yellow beacon. Other runners taking part will be highlighted in green, making it easy to see where everyone is. Many of us have made friends across the world through Zwift. We may also have friends we see regularly outdoors who also use Zwift. Creating a Meetup provides an easy way to get together on Zwift without having that back and forth via email or text. What’s more, the structure of the run is set by you. Rather than having to stick to the instructions in the official events, you can run at your own pace. Speed up or slow down when you like. Chat with your friends, take a walk break and pick it up again when you’re ready. The Meetup Feature is also useful for organizing runs with people of similar ability. Sometimes none of the pace groups in the official events quite fits the speed at which your group would like to run. 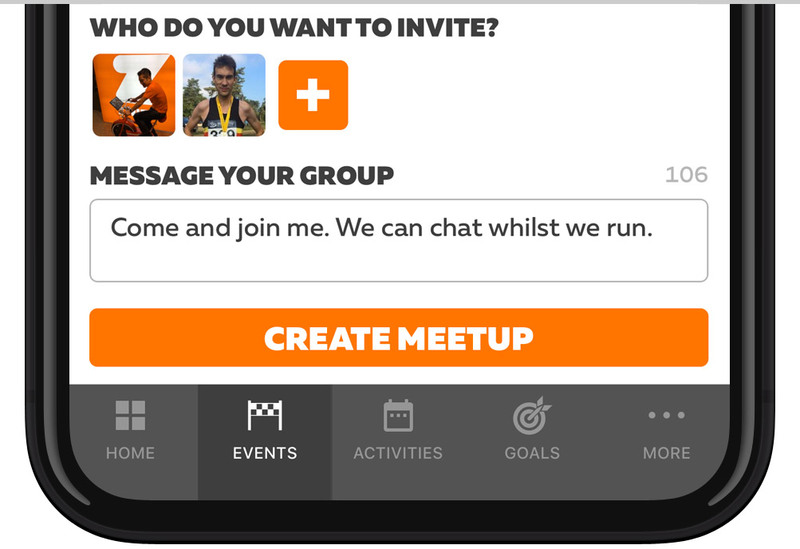 Create a Meetup to include runners who want to run at a specific pace. This allows you all to stay together, interact and enjoy the run without worrying that the group will split and you’re going to be left on your own. Although structured workouts aren’t currently supported in Meetups, there’s no reason why you can’t organize a workout session with your friends. You could identify a group leader to call out changes in pace, recovery periods or incline changes and create your own bespoke workout. We hope the Meetup features brings a more social dimension to your Zwift run experience. Enjoy your group run!